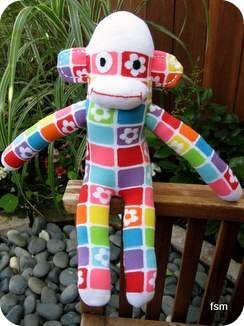 Making a sock doll monkey with bright socks like these mosaic ones make cheerful looking monkey dolls. 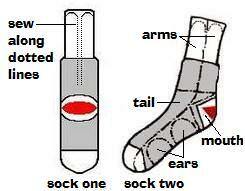 The mosaic patterns great, as you don't need to measure where to cut, just use the pattern on the socks as a guide. Step one: You will need mosaic socks. The first thing attached was the mouth. 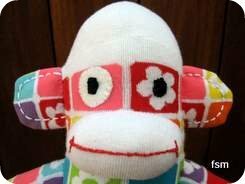 I made sure to position the top edge of the sock monkeys mouth below the top two mosaic squares. The top two squares are used for the eyes. Positioning the mouth lower than I normally would made this monkey kind of like a cone head, oh well, never mind! She's still cute! 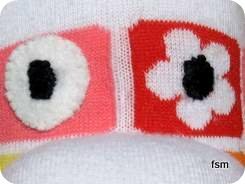 Eyes: The printed pattern on this particular sock has a white flower in one of the squares in the eye area. It was utilized as one of the eyes by embroidering black thread into the center of the flower. The second eye was created by cutting an oval shape from white felt, embroidering a pupil with black thread and then stitching it to the toys head. Ears: The ears were slightly stuffed and embroidered with white thread. The mouth is stitching in red embroidery thread. 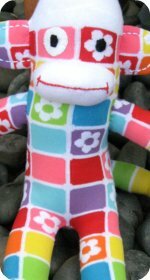 This was a fun pair of socks to make into a sock doll, the socks are very bright and cheerful. Although I didn't really do anything extra other than move his mouth placement lower than usual, the pattern on the sock is so busy that it looks very sweet. Actually, a small knitted hat would complete this little girls look. A cute hat knitted to match one of the colours that feature on the sock - lime green perhaps or purple. Even a stripy hat with all of the coulours, no, that would be some much work and there'd be so many thread to sew in. 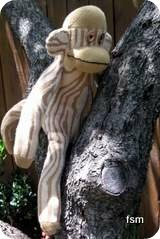 TIP: Mosaic socks are great for kids to use when making sock monkey dolls, they absolutely make cutting out the pattern much easier. 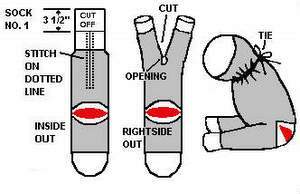 Another tip is: Instead of cutting through both sides of the sock at the same time, cut through only one side at a time. Then you are sure to cut exactly along the white lines or what ever lines you are following.